If you’ve never held a FAA medical certificate, you need to get one from an aviation medical examiner (AME) one time only. If your regular or special issuance medical certificate lapsed more than 10 years before July 15, 2016, you need to get a medical certificate from an AME one time only. And if you develop certain cardiac, neurological, or mental health conditions, you need a one-time-only special issuance for each condition. Pilots whose most recent medical certificate has been revoked, suspended, or withdrawn, had his or her most recent application denied, or authorization for special issuance withdrawn, will need to obtain a new medical certificate before they can operate under the new regulations. Use AOPA’s interactive tool to see if you may qualify. At least once every four years (48 months), you’ll need to visit a state-licensed physician. At the visit, you’ll need to provide your physician with an FAA-generated checklist, and your physician will need to affirm that he or she has performed an examination and discussed all the items on the checklist, including medications, with you. Your physician will have to affirm that he or she is unaware of any medical conditions that, as presently treated, could interfere with your ability to safely operate an aircraft. You will then need to retain the completed checklist with your logbook or in an accurate and legible electronic format. You would only provide it to the FAA if requested, such as during a routine ramp check, an investigation, or enforcement action. Every two years (24 calendar months), you’ll also need to take the free AOPA Medical Self-Assessment Course. You’ll need to provide the FAA with some of the same certifications you do today, such as an authorization for the National Driver Register to provide your driving record to the FAA, and a statement that you understand that you cannot act as a pilot in command, or any other capacity as a required flight crew member, if you know or have reason to know of any medical condition that would make you unable to operate the aircraft in a safe manner. 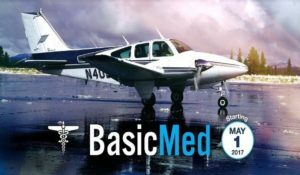 Now that the FAA’s BasicMed medical examination checklist, which is included in AOPA’s Pilot & Physician’s Guide, and the AOPA Medical Self-Assessment Course are available, eligible pilots can complete the steps to be qualified under the new rules, but are not permitted to fly under BasicMed until the new rules take effect May 1, 2017. Pilots flying under the new rules are allowed to operate “covered aircraft” defined as having maximum certificated takeoff weight of not more than 6,000 pounds and are not authorized to carry more than 6 occupants which are operated while carrying up to five passengers in addition to the pilot in command, at altitudes up to 18,000 feet MSL and at an indicated airspeed of up to 250 knots. Pilots, if appropriately rated, can fly VFR or IFR in “covered aircraft.” Pilots flying under the exemption cannot operate for compensation or hire, and must operate within the United States, unless authorized by the country in which the flight will be conducted. Third class medical reform was signed into law on July 15, 2016 by the President, after being passed by the House and Senate a few days earlier. On January 10, the FAA published what is called a final rule, based on the legislation, and set May 1 as the date the regulations will be effective. Hundreds of thousands of pilots will benefit from BasicMed which will reduce the ineffective and burdensome government bureaucracy. AOPA has led the fight for these reforms, and we will be there to make sure the process will continue to run smoothly for years to come. No organization fights harder than AOPA to protect your freedom to fly. Winning battles like third class medical reform requires an enormous financial commitment from AOPA – a commitment that can’t be met with member dues alone. A contribution to our Aviation Advocacy Fund will help strengthen our freedom to fly for years and decades to come! If you have had a special issuance medical within the 10-year lookback period (i.e., anytime on or after July 15, 2006) and your medical status is unchanged, you should be able to fly under BasicMed provided you meet all the other qualifications, including being under the treatment of a physician for your medical condition. If you develop a new condition that requires a special issuance medical certificate you will have to apply for a one-time special issuance for that condition. Under the existing third class medical regulations, pilots flying on a special issuance medical are expected to repeat the process year after year. They often have to send reams of documentation to the FAA for evaluation, unnecessarily repeat expensive medical tests for health conditions that are unchanged, and spend weeks or months grounded while they wait for the FAA to review their file. BasicMed puts decisions about medical care back into the hands of pilots and their personal physicians, people who know them well and have an ongoing interest in their health and wellbeing. AOPA has developed a Pilot & Physician’s Guide which includes the FAA’s BasicMed form. 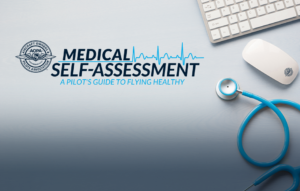 Participating pilots will present to their physician a completed aeromedical self-assessment checklist developed by the FAA. The physician will then complete a physical examination and affirm the absence of any medical condition that could interfere with the safe operation of an aircraft. Physicians will be instructed to exercise their discretion to address any medical conditions identified and to determine if any tests are needed. AOPA believes that BasicMed will encourage pilots to have regular and frank conversations with their doctors, allowing both physician and flyer to arrive at an informed medical assessment and treatment plan if needed. AOPA’s You Can Fly is working to make flying more accessible and affordable. The program supports flying clubs, gets lapsed pilots back in the air, encourages best practices in flight training, brings AOPA’s resources and expertise to pilot groups across the country, and helps high school students prepare for careers in aviation. If you need to get current, consider signing up for one of AOPA’s Rusty Pilots seminars. For more details, contact the AOPA Pilot Information Center at 888.462.3976Monday through Friday, 8:30 a.m. to 6 p.m., Eastern time or click here to contact us. For a more in-depth review, consider enrolling in AOPA’s Pilot Protection Services program.